Bibim translates as “mixed,” and bap is “cooked rice,” So bibimbap literally means “mixed rice”—and it’s rice mixed with any number of ingredients. Bibimbap that is heated in earthenware pots for serving is called dolsot-bibimbap, but you can just make the bibimbap and serve it in a large shallow bowl. 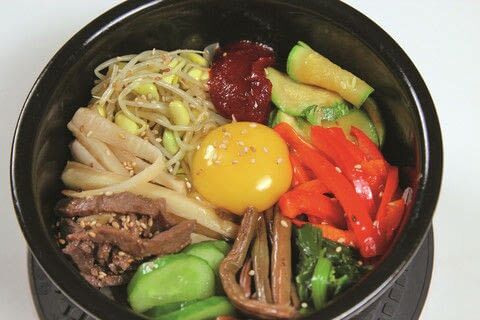 This bibimbap is special and very colorful. If you are new to Korean cooking, the recipe may seem a little intimidating. There are a lot of components, and preparing them does take a little time. But if you do make such an elaborate bibimbap, you won’t need any side dishes. 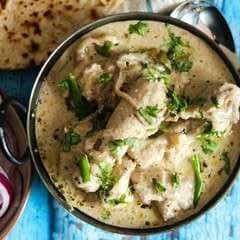 It is a balanced one-dish meal that will make you feel great. For a simpler version, see below. If you want soup to go with your bibimbap, try Egg Soup, which you can make in 10 minutes. Most of the vegetables in this dish—spinach, zucchini, cucumber—are familiar, but dried fernbrake and bellflower root are less well known to American cooks. If you can find them, this is the place to try them. Dried bellflower root is chewy and pleasantly bitter, and fernbrake adds a vegetal meatiness. Taken together, these common and exotic vegetables sing in remarkable harmony. Note that the dried bellflower root and fernbrake must be soaked overnight before you make the dish. If you are not a big fan of spicy foods, you can season your bibimbap with Spicy Soy Seasoning Sauce instead of some or all of the hot pepper paste. For a simpler variation: Pick and choose just a few ingredients to mix into the rice. I suggest soybean sprouts, spinach, and red bell pepper, which will make your bibimbap both pretty and delicious. Place these on top of the cooked rice, along with the hot pepper paste, raw egg yolk, and sesame oil, and you are done. Becky: Is there a quick way to make bibimbap? I was thinking that we could take our banchan leftovers from the fridge and mix them with rice and lots of gochujang. Maangchi: That’s right! Heat a pot on the stove, add all your leftover vegetables, and stir until warm, then add the rice and hot pepper paste. Keep stirring with the spoon until the rice is hot. Turn the heat off and stir in sesame oil to taste. I sometimes make bibimbap with kimchi: For each bowl of rice, chop ¼ cup Napa Cabbage Kimchi. Put the kimchi in a hot pan on the stove, add some kimchi brine and hot pepper paste if you’d like, and add the rice. Stir until the bibimbap is sizzling, then drizzle with sesame oil. It’s like spicy Korean stir-fried rice. Prepare the beef: Combine the beef, soy sauce, honey, garlic, sesame oil, and sesame seeds in a small bowl. Cover and refrigerate until ready to use. Prepare the soybean sprouts: Rinse the soybean sprouts under cold water; drain. Pick out any dead beans or brownish roots. Put the sprouts in a medium saucepan, add ¼ cup water, cover, and cook over high heat for 5 minutes. Drain and mix with the salt and sesame oil. Place in a pile on a large platter. Prepare the spinach: Blanch the spinach in boiling water for 30 seconds, drain in a colander, and rinse under cold water. Drain well and squeeze out the excess water. Coarsely chop the spinach and mix with the salt and sesame oil. Transfer to the platter. Prepare the red bell peppers: Heat the vegetable oil in a medium skillet over high heat. Add the peppers and cook until warmed through, 30 seconds, or the carrots for 1 minute, then transfer to the platter. Prepare the zucchini: Combine the zucchini and salt in a small bowl and let stand for a few minutes, then pat dry with a kitchen or paper towel. Heat the vegetable oil in a small skillet over high heat. Add the zucchini and sauté until slightly softened, 1 minute. Stir in the sesame oil and transfer to the platter. Prepare the cucumber: Combine the cucumber and salt in a small bowl and let stand for a few minutes, then pat dry with a kitchen or paper towel. Heat the vegetable oil in a small skillet over high heat. Add the cucumber and sauté for 30 seconds until warmed through. Transfer to the platter. Prepare the bellflower root: Drain the bellflower root. Toss with 1 tablespoon salt, then rub the bellflower for a minute to wilt it slightly and release some of its bitterness. Transfer to a sieve and rinse well to remove the salt, then drain thoroughly. Heat the vegetable oil in a small skillet over high heat. Turn down the heat to medium, add the bellflower root, stirring, and cook until wilted and softened, about 3 minutes. Transfer to the platter. Prepare the fernbrake: Cut the fernbrake into 2-inch lengths. Heat the vegetable oil in a small skillet over medium-high heat. Add the fernbrake and cook, stirring, until softened, 3 to 5 minutes. Add the soy sauce, sugar, garlic, and sesame oil and cook, stirring, for 1 minute. Transfer to the platter. If using earthenware pots (dolsots): Put a few drops of sesame oil in the bottom of each of four 4- to 6-cup pots. Divide the rice among the pots. Arrange the vegetables and beef on the rice. Top each serving with an egg yolk and 1 tablespoon hot pepper paste. Set each pot on a burner. Heat over mediumhigh heat until you hear a ticking sound coming from the rice. If using a large shallow bowl: Put the rice in the bowl and arrange the vegetables and beef on the rice. Top with the egg yolks and pepper paste. To serve: Sprinkle the bibimbap with the sesame seeds, drizzle with sesame oil to taste, and serve hot with more hot pepper paste and/or soy seasoning sauce on the side. Give each diner a spoon for mixing and eating the bibimbap. Kat: I want to make bibimbap for dinner one of these days, but we don’t have an Asian store here in Idaho Falls, so there is no way I can get hold of fernbrake. What do I do? Maangchi: Without fernbrake, it will still be fantastic! You can also substitute blanched spinach seasoned with salt and sesame oil or seasoned cooked soybean sprouts.